BRICS countries on Friday discussed the efficacy of “establishing” a bank institute and a rating agency of their own following the New Development Bank (NDB) becoming fully operational. 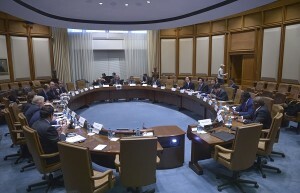 BRICS finance ministers and central bank governors met in Washington on the sidelines of the annual Spring meeting of the International Monetary Fund and the World Bank. “Deliberations were held on efficacy of establishment of New Development Bank Institute and BRICS rating agency,” a media release said. “It was decided that a technical working group would examine the issues in detail,” a statement said. The findings of the technical group would be presented to BRICS finance ministers and central bank governors in their next meeting, it added. 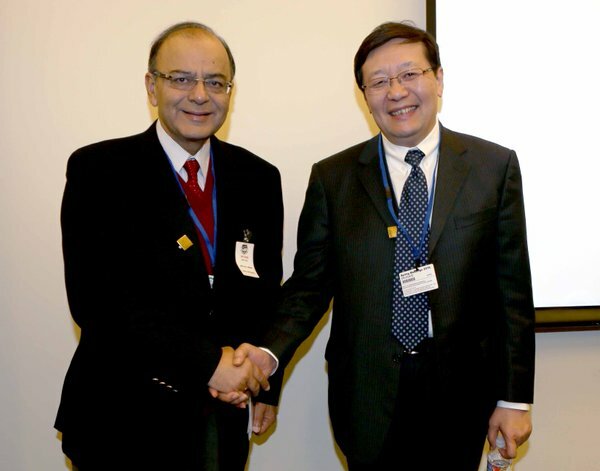 Chinese Finance Minister Lou Jiwei also held a bilateral meeting with his Indian counterpart Arun Jaitley, Indian media reports said Friday. The two discussed areas of mutual collaboration and commonality of their positions in various multilateral fora. China and the other BRICS countries are helping to fund alternatives to multilateral lenders like the World Bank. The BRICS Bank on Friday approved four green renewable energy projects from India, China, Brazil and South Africa entailing bank financing of $811 million. Russian Finance Minister Anton Siluanov said on Friday the five finance ministers of the BRICS countries have agreed to take a unified stance on IMF quota system reforms. “We need to collectively take a stance on the revision of the quota system,” Siluanov said. The US Senate in December ratified reforms to boost the representation of emerging economies at the IMF as part of a budget bill that will clear the way for new industrial powerhouses like China and India to have more clout at the international lender.A sprawling budget deal to keep the US government operating through next September contained a measure to put Brazil, China, India and Russia among the IMF’s top 10 shareholders and give emerging markets more influence at the global lender. However, BRICS countries still only have a 14.7 per cent voting share, which is not enough for a veto that requires 15 per cent. In a communiqué following the annual BRICS Summit in 2012, BRICS leaders had expressed frustration with their limited “voice and representation” in existing global forums considering the size of their economies, which at the time were sizzling at an average growth rate above 5 per cent.